Each day we all face challenges, quietly carrying the burdens of worry, sadness, loss or letdown with us like spare change in our pockets. While some pockets are more laden than others, rattling and jingling with each step, I venture to say we all share empathy and kinship in wanting to make things better, not only for ourselves, but for others. At least that is what I experienced this last week when I lost my sidekick, compadre and wingman Boz, bulldog extraordinaire. I was deeply heartened by and grateful for the outpouring of kindness, stories, well wishes and support I received after posting news of his passing. I loved the “little guy” and apparently so did you all. If you think your thoughtful and loving comments went into the ethernet, you are wonderfully mistaken. Your words went in one ear and straight to my heart. I’m not quite ready to let them out the other ear, just yet, so please know your words were like a hug for someone in need. We may forget we live in a world of good people with caring souls who step up when the occasion arises, though each day we are bombarded with images and words that would suggest otherwise. But last week, this islander, dog lover, farmer and writer, experienced the hearts and souls of strangers, and I’m here to report, they glimmered like gold. Again, thanks to you, and to my dear family, and friends, it’s a better week. My friend Daniel shared a lovely quote. Now I realize that a better post title would have been Heartened by the Kindness of Friends. The term Kindness of Strangers seems out of place now. Thank you, friends. I know last week was tough, so I glad this week is better. We do not know each other, but I love your posts, use your recipes and I have a great fondness for dogs; especially bulldogs. My heart goes out to you all the way from Vermont. We do not know each other but I follow your posts, use your recipes and have a great fondness for dogs; especially bulldogs. What a great post, Tom. There are indeed some fine folks “out there”. i can feel your emptiness. you sure loved that pup and he loved you too. Poignant and sweet reminder of what a privilege it is to be “owned” by beloved pet. I feel sad for those who have never had the experience. Thank you for sharing Boz with us. Tom, so glad that this week has been better. Give Gracie an extra big hug from the rest of us. One of my favorite sayings is, “God, please help me be the person my dog thinks I am.” We love and care for our pets, then get so much more in return. I’m so sorry for your loss. But what a lucky dog that Boz was! No two people who have in common a love for dogs will ever completely be strangers, though they may never meet face to face. I’m glad this week is being easier on your broken heart. Sending love your way. That last photo is a beaut. Deer watch mode or Nana nap?? Such talent. Tom, so glad to hear you are feeling the love. My heart goes out to you. Be comforted by the happy times you had with Boz – you will always have those memories. Oh my. Had a bit of a cry myself when I read your post. So grateful for your loving tribute to the kindness of strangers and that it has been a better week for you. Our fine furry friends are so much a part of our lives, so I was deeply touched by your loss. The last week or so have been bedlam here…am so behind in e-mails, posts. When I was seeing that you had lost your precious little buddy, my heart instantly felt the pain for you. As a dog lover myself, and with far too many dogs still here, I am familiar with the way your heart feels shredded. In time, it will piece back together…maybe not like it was before, but…it will start to not hurt quite as bad. I am very sorry. Had a Yorkie that was forced on me one time when I was still working at the vet’s….did not want her, did not particularly care for small dogs. But she had special needs, so I took her on. You know that old saying “good things come in small packages?” That was Jitterbug to the max. She improved living with us, and went on to live a very full life, for 17 1/2 years…that little 2 1/2# ball of fur, was at my side. She went to work with me, staying on my desk in a little basket. Her longest trail ride (in my shirt) was 11 hours. It was a hot day, we rounded a corner on the Pacific Crest Trail, found a delightful pond. We all slipped out saddles, re-mounted, and rode our horses into the water…suddenly everyone was laughing at ME! Pointing. I looked behind me, and here was little Jitterbug, paddling as hard as she could…her long coat floating out around her like a huge lily pad. She was mid age by then, and had never been swimming before…but, there was no way she was going to be left behind. I of course started laughing so hard, and sweaty horses get very slick it seems when soaked….my horse started to turn back, the opposite way I was twisted about, and yup……into the drink I went…I came back up sputtering, and there was Jitterbug…in my face…I swear she was laughing. All these memories are there for us to savor, when we miss that little body on the bed, or turn to chat with them when we are doing our chores…whatever. God did create these marvelous creatures to be our companions, to share their world for as long or as short of a period as they have. Thank you for caring so deeply for your awesome dog…again, sorry for the pain. But each day you had together? Is worth the pain you are going through now. Thank you so much for sharing this – you’ve been on our minds all week. Such lovely words. I’m so sorry you lost your dear Boz. Sending ease of heart to you and Gracie. You, Gracie and Boz have been so much in my heart this week. I remember the Merwin poem and how it so beautifully expresses how we experience such a deep loss. I think we all have felt that a little chip was knocked off our hearts knowing Boz is resting now. May you continue to know much kindness in many ways. I am so sorry that you have lost your friend. 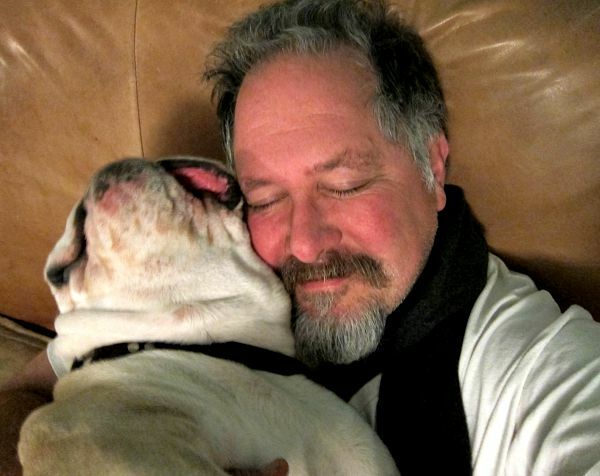 Thanks for sharing bulldog antics with us, and please don’t forget you always gave Boz the best. I’ve long enjoyed your writing and sweet pictures of Boz and Gracie. We lost our dog last year. I am so sorry for your loss. I’m a new convert so I wasn’t with you last week but may I add my condolence to the many you received. Being close to losing one of ours I can relate. Be assured he is running around heaven playing in the green grass with others. God bless. Though we don’t really know each other, we met at the fountain demonstration this summer (loved). I took one of your cards and soon after found your blog that I read with great interest and loved the entries that included Boz and Gracie and it didn’t take long to fall in love with both. Boz had such a huge personality in a little square body. I totally “got” him, he came through very clearly and I am envious of all your friends that had the privilege of knowing him. He was utterly delicious and very precious. So many of your readers must have loved him as I did. A great big hug to you Tom and a big kiss to Gracie. Losing a dog is always heartbreaking and I feel for you. Somehow our attachment to these wonderful animals seems to burn more brightly for the short time they are with us. My family has a collie who is now almost 14 and she is showing her age. I stop to give her extra attention knowing that our time is limited and it’s so bittersweet. The better the dog the harder the parting and Boz seems to have been an extraordinarily great dog. Here I am, tearing all up again, reading this second post about Boz and your loss. The ‘kindness of strangers’ just redeems one’s faith in people, doesn’t it? When what goes threading from one person to another, across any chasm of time and space, are the deepest feelings of love and loss, sympathy and hope — I feel blessed, getting just that little taste of all the blessings showered on you, at third hand out here in the cyber ethers. Glad to know it helps just a little. Hugs again, and anon. Boz’ s place in posterity is assured! You give Gracie a big hug. Pets are just as sad as we are. ((((hugs)))) for you both! 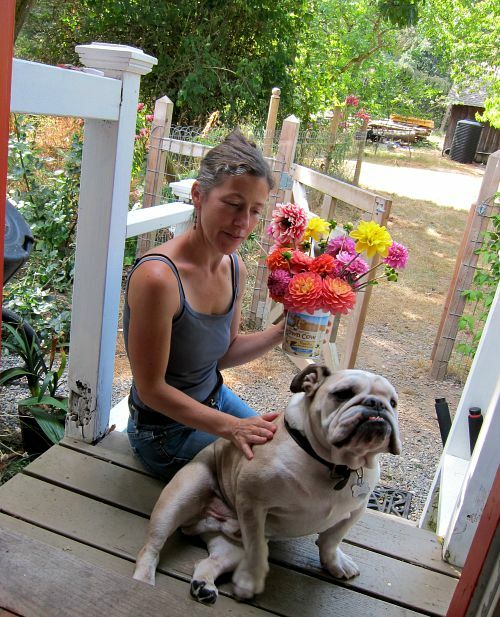 I am sorry to hear of the loss of your beloved buddy and compadre, Boz. Thank goodness for the beautiful and wonderful memories that you hold in your heart. I am so sorry to hear of your loss. It was apparent from the photographs you shared with us, that Boz had an enormous personality and his absence has left a huge void in your life. 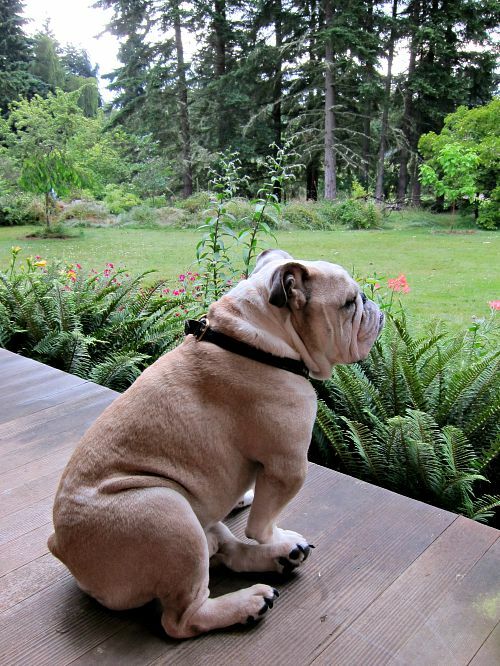 The last portrait of him, looking out over the garden from the porch is beautiful, worthy of framing. I hope and pray that time will mend the grief quickly and that soon the recollection of him will bring more pleasant memories rather than sorrow. I’m so sorry for your loss. Boz was quite the funny guy. Remember, that he may have been a part of your life, but to him, you were his whole life. And what a wonderful life you provided him. I’m sure he is living it up at his big farm in the sky.